Discipling Marketplace Leaders (DML) has a threefold focus: 1. Universities, Seminaries and Bible Schools, 2. Church Leadership and 3. 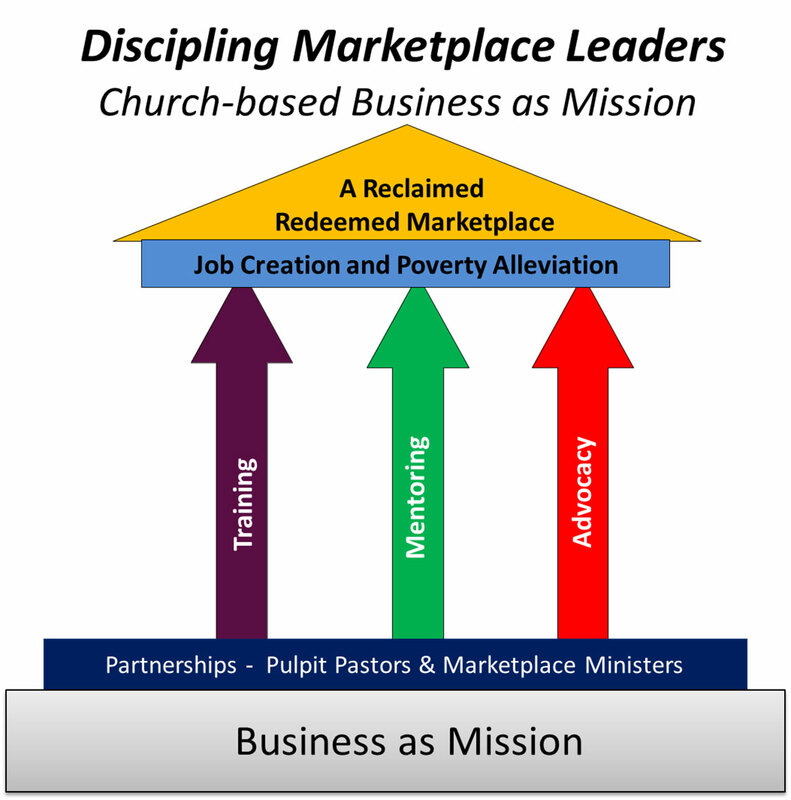 Christians in the Marketplace (business, government, and education). Through these three conduits, DML seeks to resurface the core Biblical truth that God created humanity to work and care for creation. This makes “work” a holy calling. It is on this foundation, called the Great Commitment (also known as the Cultural Mandate) that the Great Commandment is lived out and the Great Commission is carried out. Universities, Seminaries and Bible Schools – God is calling His people to rediscover the Biblical truth that all work, done to the glory of God, is holy. This truth needs to flow out of Christian Institutions at all levels. Church Leadership – Pastors and Christian leaders are the gatekeepers for the local congregation. By rediscovering the Biblical truth of the priesthood of the believer the local church unleashes the power of every believer as light and leaven in and through the community. Christians in the Marketplace – The majority of the members of most churches are involved in the marketplace, through business, labor, education and/or government. Learning how God has called us to work, believers gain new insights on how to live for Jesus 24/7. DML is designed to be part of the systemic foundation of the local church. Through the provision of tools and training, churches equip their members to impact the community and marketplace by rediscovering work as worship. The holistic approach helps every believer to understand how God prepares them to live out their faith 24/7 at work. As a church has men’s ministry or a women’s ministry the local church can now have a DML ministry. The illustration on the right provides a visual of the critical components of the DML ministry. Step One: Community Entry – DML is shared on a one-to-one basis with pastors and Christian leaders. This is done at conferences, pastor associations, seminary, and Bible School administrators. Step Three: Fourteen-hour workshop (two-three days) for pastors and key leaders. This provides decision makers with the theological foundation of church-based business as mission as well as an in-depth explanation of the different parts of the ministry. 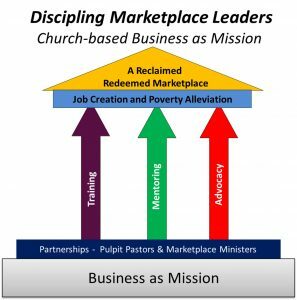 Step Four: Application of Intent with commitment to “30 Days in the Marketplace.” Before DML gets directly involved the senior pastor is asked to do four sermons on Church-based Business as Mission. In addition, the church is provided devotions, videos and bible studies to help the congregation understand work as worship. Step Five: The church, led by the senior pastor, carries out the 30 Days in the Marketplace and reports back to the DML representative. Microbusiness Training – startups, single person enterprises from street hawkers to small shops. Small and Medium Business Training – designed for a business that has two or more employees. All the programs require a commitment to follow through with completing the homework and in- class assignments. The goal is application, not simply content mastery. Mentoring and Advocacy – participants are encouraged to enter into mentoring relationships, usually peer to peer facilitated by the local church and the DML staff. The DML staff is encouraged to work with participants to target areas that businesses can work together on to correct things like bribery, political bullying and environmental issues. 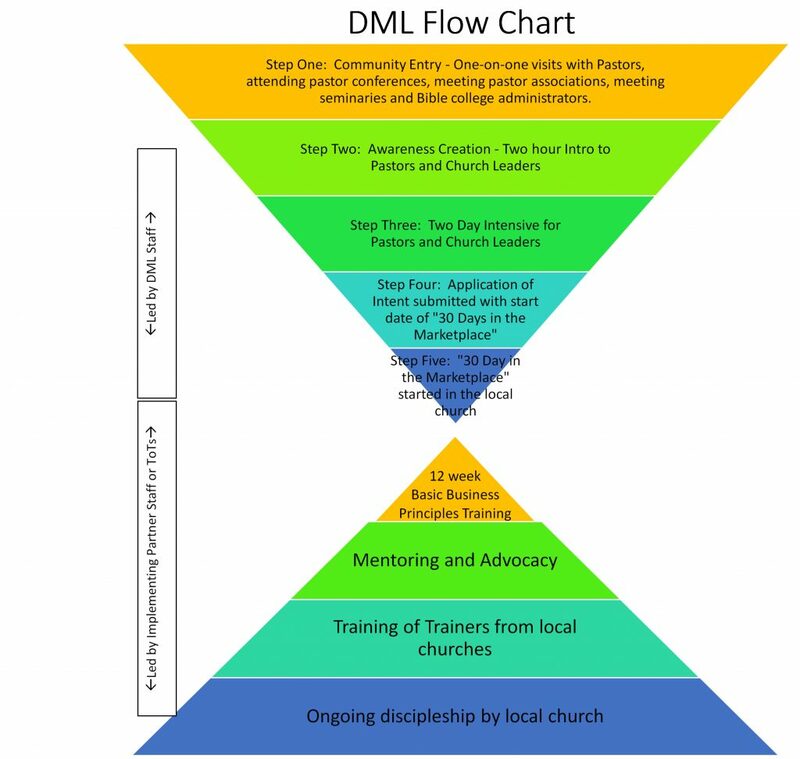 Training of Trainers – The goal of DML is to empower and equip the local congregation to use Church-based Business as Mission as a key part of the family of ministries that make up the training and discipling in the church. To this end, DML provides training for those selected by the local church to be trainers in the three types of training offered by DML. The goal is for DML to step back over time into a consulting role when needed and desired. Once the TOT is completed the local church takes full ownership. On-Going Discipleship – DML is committed to helping pastors establish their role as equippers of the saints (Eph. 4:12). Transformation is an inside/outside process. It is essential that local congregations understand that discipleship begins with training and equipping and is completed with application and transformation. Knowledge in the church must be expressed in transformation in the community. Both of these are essential for fulfilling the call to disciple the nations. Target Audiences – DML seeks to impact three key audiences. The Local Church – The first is the local church including pastors and key leaders. These control what happens in the congregation. At this stage a course correction needs to take place, moving the local congregation from an event-venue to an equipping/sending venue. The goal is to move the congregation from being tied to the four walls of a building to become the church in the four corners of the community. Seminaries and Bible Schools – While the core of the curriculum in institutions of Christian learning needs to remain Bible based, it must shift to being able to answer the questions of a new generation. Africa, the youngest continent demographically, risks losing the up-coming generation to the growing needs of the marketplace. These institutions need to answer the question, in its fullest, as to why God created humanity and what is the role of the humanity in a market driven environment? Jesus began the discussion with the woman at the well by addressing the felt need she came to satisfy. The next generations is coming to the source of truth to understand where their occupations fit in the scope of God’s truthy. Business Community – Work as worship was addressed by the great reformers and the early church. All saw work as key to spiritual transformation and growth. Once again we need to help those living and working in the marketplace to understand that their businesses exist for transformation: transformation of economies, transformation of the people and transformation of the environment. Those in business are not simply making a living, they are fulfilling a call. This group of God’s people provide the greatest “least” tapped, capable, when ignited with purpose of reaching the world for Christ. Missional – sharing the love of Jesus intentionally with those they come in contact with naturally. Economical – Aid does not lift a country out of poverty. The economic bottom line ensure capacity to deal with personal finance while having more to help other rise out of poverty. Environmental – The Great Directive in Gen. 1:28 puts the burden of caring for creation squarely on the shoulders of in special creation, humanity. Christians should be at the forefront of ensuring the sustainability of a creation entrusted to them by the great Creator. Social – Loving God and others is central to the message of the Good News. Every believer needs to examine closely the call to be “their brothers keeper” including businesses. To love all who bear the image of our Creator is central to the message we share.